Welcome to the Axe One Design website. The Axe O.D. is a traditional 12 foot clinker built Bermudan rigged dinghy. 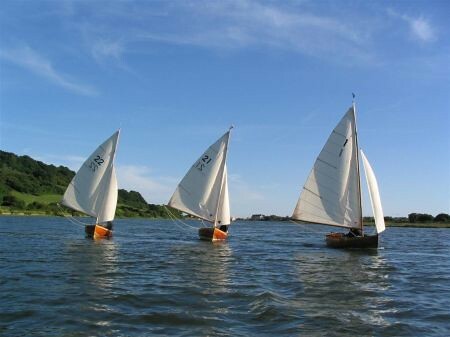 The boats were designed in 1951 specifically for members of the Axe Yacht Club, based at Axmouth in South East Devon. The A.O.D. was principally a two man dinghy, but could easily be sailed single handed. Races for the class were held both in Seaton Bay and on the Axe estuary, launching from the club’s open beach or onto the tidal Axe estuary. The class was designed by amatuer boat builder Jack Drew, who was then Vice Commodore of the A.Y.C. 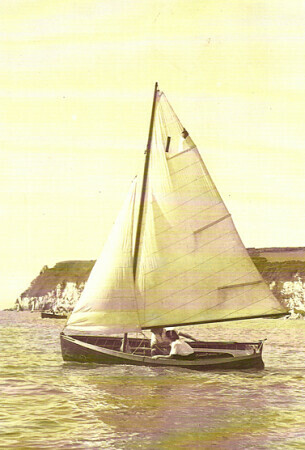 Jack constructed the first batch of nine boats in the early 1950s. The fleet continued to grow and in the 60s numbered nineteen. Sadly most of these boats have disappeared with out trace, but one of the original fleet survived intact- Whimbrel, No.1, she continued to sail as the sole representative of the class. In 2000 a new A.O.D. was built, rekindling interest in the class. Subsequently four (soon to be five) more have been built in Fowey for A.Y.C. members and during this period two more of the original fleet were restored and re-commissioned. Invariably each summer the boats return to Cornwall to sail on the Fowey, Fal and Helford Rivers and attend Fowey Classics. 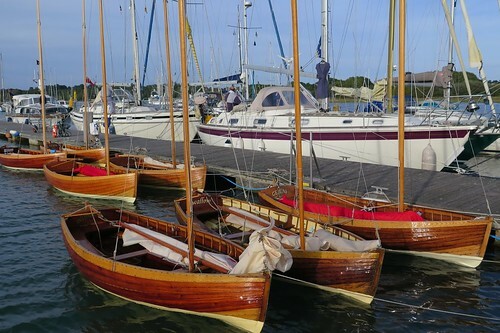 The small fleet of dinghies invariably attract attention, the sight of varnished dinghies cannot help but draw inquiring and admiring comments. By coincidence, rather than any specific ruling each of the boats has adopted the same colour scheme – varnished topsides with cream coloured paint below the waterline. This now makes telling them apart somewhat difficult when drawn up on the beach together! Although Swallow is the odd one out, since it has been impossible to remove all traces of paint from inside her hull, so she is the only A.O.D. with the interior hull painted. The original sails were white, however the class has now adopted cream coloured sails throughout, with the panels cut in half width, reflecting the narrower panels of the old cotton sails. In todays world of modern performance dinghies we are fortunate to retain our indigenous one design class. So many others have disappeared, had Whimbrel not survived then a similar fate would have faced the AODs. The resurgence of the class came with the building of Shearwater in 2000; some 35 years after the last AOD to be built in the 1960s. Her building inspired other local sailors to take that step and with the restoration of two more original boats the class re-established itself. The AODCA is only aware of the three original boats, should there be any other survivors unknown to us then we would very much appreciate hearing from them. Since 2005 the A.Y.C. has organised a separate class series for the A.O.D.s within the summer River Races. Appropriately the Axe Ones now race for the Jack Drew Cup donated by Jack in 1960. We are indebted to him for his enthusiasm and attention to detail in designing and establishing such an incredibly pretty and pleasurable classic dinghy to sail. 2018 saw the Axe One Designs celebrate 65 years, a regatta was held in July to compete for the Jubilee Cup. This was complimented by the addition of a new AOD No.24. – ‘Maflingo’ ( launched 14th April 2018 – see news page), which now brings the fleet up to eight boats. Axe One Design Class Association.